Use this information to learn how Elasticsearch Service instance configurations such as gcp.kibana.1 or aws.data.highio.i3 relate to the underlying cloud platform hardware that we use when you create an Elasticsearch Service deployments. Deployments use a range of virtualized hardware resources from a cloud provider, such as Amazon EC2 (AWS) or Google Compute Platform (GCP). We call these virtualized hardware resources instance configurations on Elasticsearch Service, but you might recognize the underlying hardware they build on as instance types on AWS or machine types on GCP. 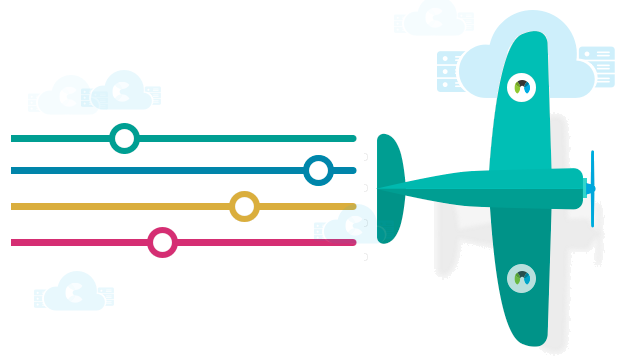 Instance configurations enable instances—the products and features of the Elastic Stack—to run on suitable virtualized hardware resources that support their intended purpose. For example: If you have a logging use case that benefits from Elasticsearch data nodes with large amounts of slower but more cost-efficient storage space, your instance configuration will use large spindle drives rather than more expensive SSD storage. Each instance configuration provides a specific combination of CPU resources, memory, and storage, all of which you can scale from small to very large. The cloud platform that the underlying hardware belongs to, such as Amazon EC2 (AWS) or Google Compute Platform (GCP). Optional: The hardware resource characteristics of the instance configuration, such as optimization for I/O, storage, CPU (compute), or memory. The short name for an AWS instance type or a number for a custom GCP machine type on which Elasticsearch Service hosts an instance configuration. Host machines are shared between deployments, but containerization and guaranteed resource assignment for each deployment prevent a noisy neighbor effect. A word about terminology: Elasticsearch Service instance types are not the same AWS instance types. Elasticsearch Service instances types refer to the deployable products or features of the Elastic Stack that we support as part of a deployment template, such as Elasticsearch and Kibana. You’ll sometimes also see them referred to as instances, which just means that they are running in a deployment. When you resize or change the configuration of Elasticsearch, for example, you are working with the associated instances, in this case Elasticsearch nodes. 1 Memory sizes ensure efficient hardware utilization and might not scale to the power of two (n2). For sizes above 64 GB, we create multiple instances or nodes to ensure efficient JVM heap sizes. For example: If you provision a deployment with a 128 GB Elasticsearch cluster, two 64 GB nodes get created. To learn more about why we offer these JVM heap sizes, see Heap: Sizing and Swapping. To learn more about AWS EC2 hardware instance types, see Amazon EC2 Instance Types. Instance configurations map to instance types and GCP machine types as follows. Note that Elasticsearch Service uses custom GCP machine types. To learn more about GCP hardware machine types, see Machine Types.